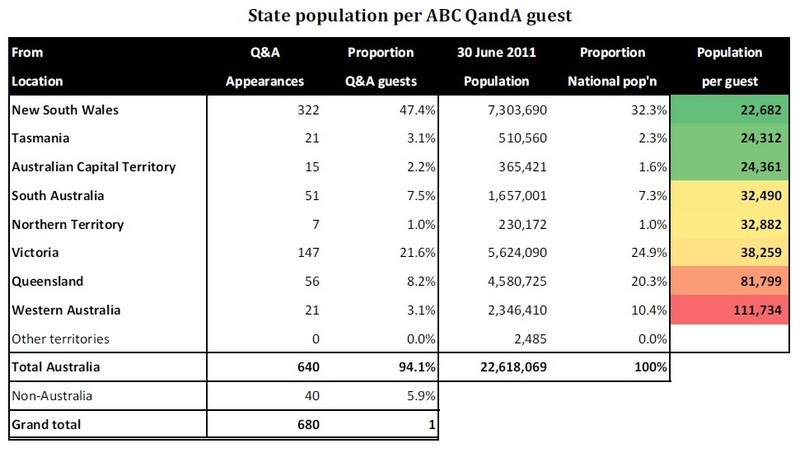 Independent Australia managing editor David Donovan presents his detailed analysis and research about the limited range of views and lack of diversity found on ABC's popular 'Q&A' current affairs panel show. Close to 100 per cent of shows have one or more speakers from each of the two major parties (Labor and Liberal). Q&A is evenly balanced in terms of total progressive and conservative politicians. Minor parties and Independents seldom appear on Q&A. About half of all guests are sitting or former politicians. Apart from politicians, the show has an emphasis on guests from the media and entertainment industries. Close to half of all guests reside in Sydney. Capital city residents are over-represented, while regional voices are very underrepresented. As a proportion of population per guest, NSW and Tasmania are significantly over-represented, while Queensland and Western Australia are extremely under-represented. 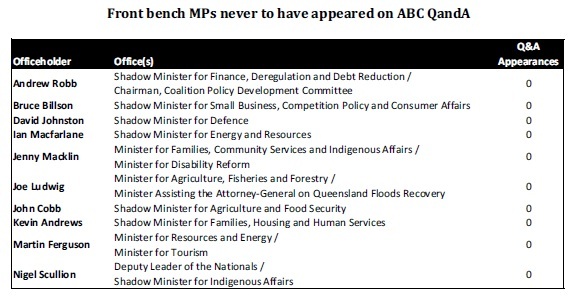 10 sitting senior Federal MPs have never appeared Q&A. Several prominent Australian identities have never been asked to appear on Q&A. Q&A favours certain think tanks over others, with the IPA having 4 staff members making 11 appearances, while no representative from The Australia Institute has ever been seen on Q&A. An analysis of the political affiliations of the guests on Q&A shows a remarkable consistency. (See Appendix A for a full list of guests by episode). In almost every show, Q&A includes two current sitting Federal MPs – one from Labor, one from Liberal – and one other politician — usually a former Liberal or Labor MP, or more rarely a representative from the Nationals, Greens or an Independent. In the final analysis, it could be argued that the show has a slightly progressive bias, with Labor and Greens representatives making up a total of 170 of the 680 panellists, while the Coalition has 155. 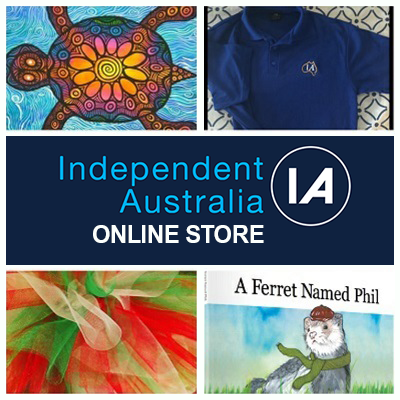 However, if one includes the IPA (11) [see Figure 1 above], which generally acts as a Coalition lobby group on Q&A, the strongly conservative country Independent Bob Katter (2) [see Appendix B – Appearances by guest] and former Family First senator Steve Fielding (1) [see Appendix C – Appearances by organisation] the difference becomes 170-169. An analysis of the primary professions of the guests [see Figure 2] shows that close to half of panellists are sitting or former members of parliament (304 out of 680). This total does not include mayors, councillors, political candidates, or political staffers. 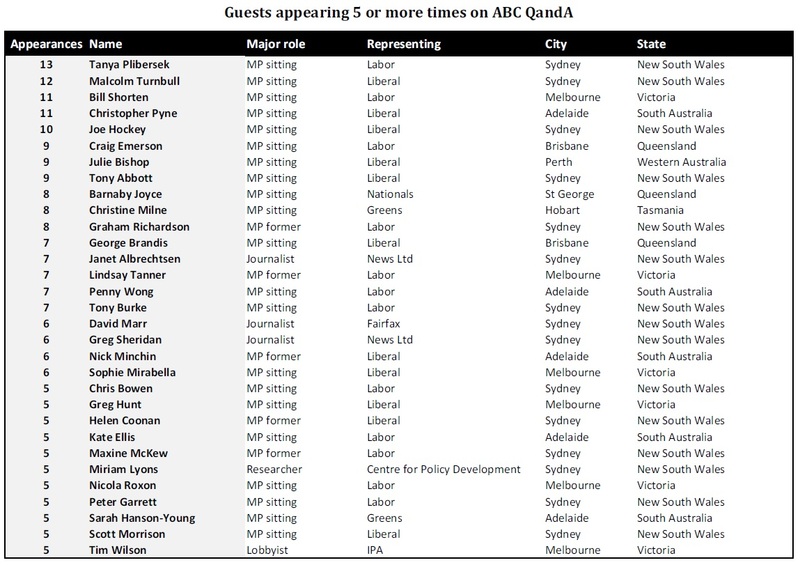 Apart from politicians, the show favours members of the media, with journalists from News Ltd, Fairfax and the ABC being the most common media guests [see Figure 2]. Comedians and writers round out the top 5 professions included on Q&A. Q&A is usually filmed in Ultimo, Sydney, though it does occasionally go on the road. An analysis was done of the guests on Q&A using the best available data in their bios. This was sometimes difficult to obtain, and some guests have no doubt moved around between their appearances on Q&A, something not captured in this study, which only lists one address per individual. Where a residential address was not able to be found, this study used the address of their primary employer or where they usually seem to reside or be in their bio to obtain a place of residence. We hope that this information will be able to be corrected and refined, though we are confident it is within acceptable tolerance thresholds. 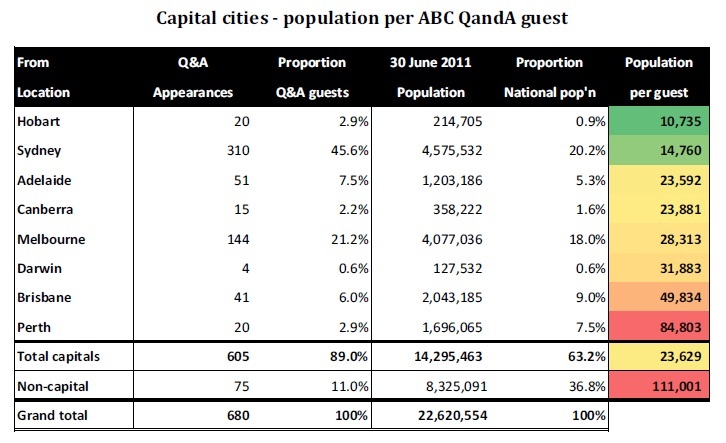 Bearing that in mind, it seems around half of all guests on Q&A reside in Sydney [note figure 3]. In terms of capital cities, Sydney has about a third of the population per guest as compared to Brisbane, and about one-sixth when compared to Perth. Hobart appears to be the most overrepresented city in Australia, having the same number of guests as Perth despite having about one eighth of the population. 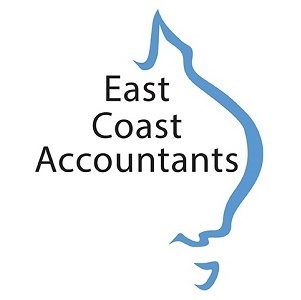 Guests from non-capital cities are even more under-represented than Perth, with an average of one Q&A guest per 111,001 people in regional Australia, as compared to one per 14,760 for Sydney. In terms of the states, the situation is even more stark for Queensland and Western and Australia, with NSW having 4 and 5 times the representation of those states respectively [see Figure 4]. It can only be concluded that the producers of Q&A operate under the Paul Keating maxim: "If you don’t live in Sydney, you’re sleeping rough." Capital city residents are over-represented, while regional voices are significantly under-represented. As a proportion of population per guest, NSW and Tasmania are significantly over-represented, while Queensland and Western Australia are very under-represented. The study shows that the programme uses an extremely narrow range of talent. Out of the 680 panellists appearing since the show began, only 345 different individuals have appeared — an average of close to two shows per guest. This average is bumped up because some guests have been on the program up to 13 times, including tonight’s guest Tanya Plibersek, despite only becoming a senior minister until December last year. 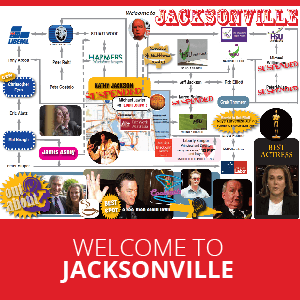 Another guest appearing tonight, Malcolm Turnbull, is making his twelfth appearance on the show [see figure 5]. Why it is necessary to have senior politicians on every Q&A is not explained. In any case, this response does not appear to stand up to scrutiny. 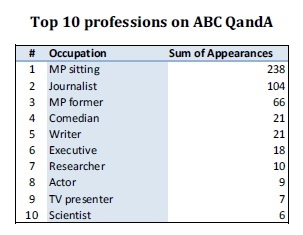 Analysis of the Federal Parliament shows that there are a great many politicians who have never appeared on Q&A. Even on the current front bench in both parties there are 10 senior politicians who have never appeared on Q&A [see figure 6]. For comparison, there are 10 senior politicians who have appeared on Q&A eight times or more [see Figure 5]. It appears the producers also have their favourites when it comes to “thinktanks”, with the free marketeering IPA topping the list with 4 different panellists and 11 appearances in total (not including appearances by former staff members) [see figure 7].